Our exclusive Cabinet-Sized Elfa Mesh Closet Drawers are ideal for maximizing the available space in a small closet or armoire. Available only at The Container Store, this solution includes one 1-Runner Mesh Drawer, three 2-Runner Mesh Drawers, and a Melamine Top plus Back Stop Pins, In & Out Stops, Frame Feet and Label Holders for each Drawer. The fine weave of the mesh prevents small items from falling through. Elfa is an entirely customizable system - if this isn't exactly the solution you're looking for, try our Elfa Drawer Planner. I want to use 2 of these sets to put an extended ironing board on top. Will these cabinets support the weight of the board &amp; pressure of ironing? Each elfa Drawer Frame of our Cabinet-Sized elfa Mesh Closet Drawers can support up to 99 pounds of evenly distributed, static weight. Our Elfa Casters (link provided below) work in conjunction with all of our Elfa Drawer Frames. How much does this kit weigh and how much weight can the drawers hold? Our elfa Cabinet-Sized elfa Mesh Closet Drawers solutions weighs approximately 20 pounds when fully assembled. The drawers can accommodate the weight of clothing and accessories as well as cosmetics, toiletries and cleaning supplies stored in a cabinet or under a sink. Are there wheels that can attach to this product? 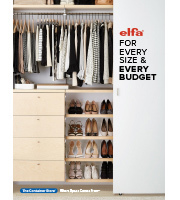 Yes, our elfa Casters can be added to our Cabinet-Sized elfa Mesh Closet Drawers to make it a mobile solution. How can I best protect this cabinet-sized elfa mesh drawer unit for several months&rsquo; storage in a storage locker? What does the Container Store recommend to best protect this item? Stretch wrap? Padding on the corners? Tape the drawers so they won&rsquo;t move? We suggest securing the drawers within the frame with Stretch Wrap then covering the entire unit in a Sealable Pillow Top Mattress Bag for dust-free storage.